As new Miss Brown’s Fancy solo dress. We are the first owner of this dress. 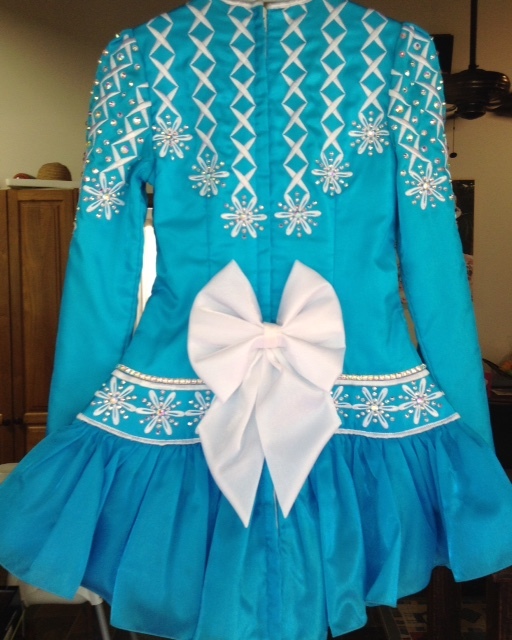 Turquoise twinkle satin bodice and sleeves, with pretty white embroidery design, covered in hundreds of sparkling AB crystals. Modern style skater skirt constructed from two layers of turquoise twinkle satin (one layer has been gently tacked up to shorten length of dress and can be taken down very easily if needed). 2 shawls included – a large white twinkle satin central bow and a soft shawl of white lace with pretty silver sequin floral design. 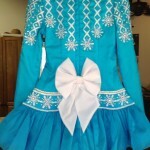 Turquoise and white striped skirt lining and internal waist tie for a firm fit, also zipper is full length from back of neck to hem, so the dress opens up completely for easy and quick costume changes. Adorable white twinkle satin bow attached to left side of dropped waistline. Included are striped bloomers and embroidered headband, shoe buckles and earrings. Ample seam allowance for let-down and let-out alterations.